Arcam’s rSeries of components genuinely extend the functionality of both Arcam’s product line, and electronics in general. Few companies (only Musical Fidelity and PS Audio spring to mind) produce a similarly extensive line of truly useful audio components, as they all combine a refreshing blend of versatily, affordability, and a complete absence of BS. The rPhono is one of the latest models, and it’s a damn fine inclusion to the audio pantheon. 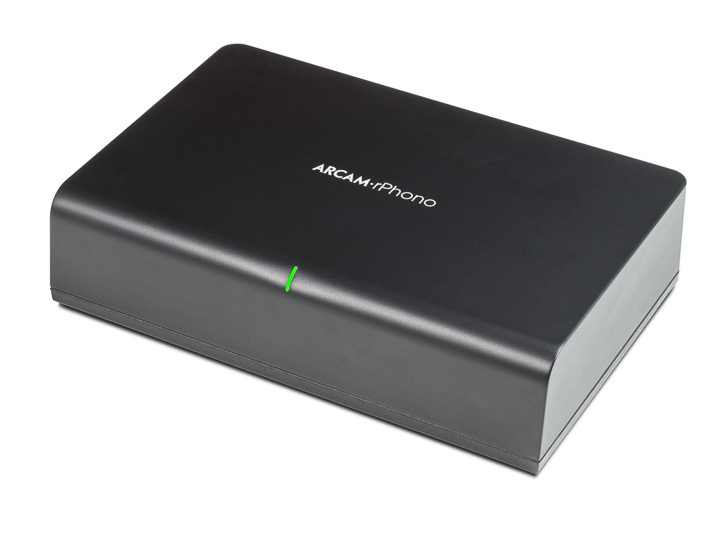 As the name suggests, the rPhono is a standalone phono stage. It’s RIAA only, but a series of rear-mounted DIP switches offer a surprising amount of flexibility in cartridge options. Adjustable impedance, capacitance, and gain afford the rPhono far greater choice in MM and MC cartridge selection than its bluff exterior and £399 price tag would ever suggest. There is also an inclusion that has all but disappeared from modern phono equalisers, but its inclusion is gratefully received: the rumble filter. While the modern turntable is now more resistant to rumble than ever before (Crosley notwithstanding), the variable quality control of some vinyl pressing plants means finding an LP without some degree of warp can be difficult, and those records that aren’t so warped as to require replacement can still undermine the performance of a good audio system, and a rumble filter is a lot less discomforting that watching your bass drivers flap about. Unlike LP replay systems from a couple of generations ago, this rumble filter is hidden away on a rear-mounted DIP switch, and is not intended as a button you action as and when the mood (or the flapping cones) take you. Front or rear mounted, there will be many who welcome the reintroduction of the rumble filter. Choice of cartridge notwithstanding, the rPhono is simplicity itself to setup. It runs from a 12V, 2W wall-wart power supply (or can be fed from modern Arcam amps that come with an outlet). There is no need to bother hunting for aftermarket power supplies, because Arcam did sterling work ensuring the power feed is well isolated from the equaliser electronics. Even those pesky DIP switches and the gain adjustment are taken care of, thanks to a supplied tool that sits on the underside of the black-finished aluminium case. The rPhono also comes with a pair of phono-phono cables to connect the phono stage to the amp, but I suspect in most cases, these will stay in the box and something better gets put to use. Nevertheless, it’s a measure of Arcam’s no-nonsense approach that free cables are supplied in the box. Similarly, running in, Arcam-style involves taking the rPhono out of the box, and plugging it in. Does it get better over time... yes, a bit, but not enough to write lengthy tomes about burning in or conditioning. Once you have set your cartridge loading to suit, and plugged everything together, the rPhono is good to go. Minimalism reigns supreme though; just a logo on the top panel and a green LED bar on the front.